The Cambridge Diet is a diet invented by a scientist at, yes, you guessed it Cambridge University. It is what is known as a VLCD (a very low-calorie diet). In fact it’s so low you can only do it for 12 weeks at a time, then you have to increase your intake again for at least a week before continuing. While you are on the diet you only consume around 400 calories a day, and live off your body weight (fat) instead. In the first two weeks it is an entirely liquid diet. Where you have the choice of soup, milkshake or porridge for your three main meals a day and nothing else. From the third week onwards you can swap one of the liquid meals out for a nutrient bar instead. All meal replacements contain your daily allowance of vitamins & nutrients. If you are a man or over 5 feet 8 inches tall this may be more. Notes: NICE guidance states that anyone choosing to follow a diet of less than 600 kcals should do so under clinical supervision. As I am starting on Step 2, I will give a little more information on this step. 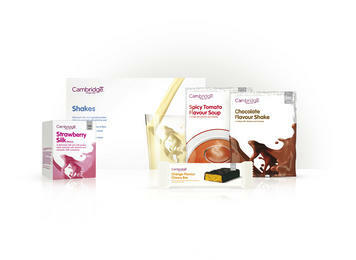 Three Cambridge Weight Plan products. • Cambridge water flavourings and occasional low-calorie/diet drinks, flavoured waters or squashes. Buy Coke Zero this can be drank throughout the diet, and for me its nice to taste something I actually enjoy! Sugar-free Mints and gum can be used on this diet, so stock up! this also helps at the later stage of the diet where bad breath makes an unwelcome appearance. I am going to Ibiza on the 3 July, Which is 27 days (3 Weeks & 6 Days) I would like to lose 18 lbs by then, but as the average weight loss is a stone a month I would also be happy with that! I have on my Ticker below 18lbs this would take me to the weight I was last year around this time when I split with my husband, its very optimistic but worth a try! After tasting the first REVOLTING Porridge I was dreading my next meal! and really struggled and gave in that same day! After speaking to a friend that had just lost 10lbs in her first week I went back to considering how I could adapt the diet to myself and my lifestyle and researching this diet aswell as other shakes and diets I decided to give it another go but this time I have added a small meal by skipping Step 1 and Starting on Step 2. I had an awful porridge for Breakfast but added a bit of cinnamon which helped a tiny bit, and washed it down with some Coke Zero, by Lunch Time my stomach was starting to rumble so I had a Chocolate Orange flavoured shake which was surprisingly tasty and filled me up, In between those I survived on Coke Zero, Large glasses of Water with Ice and Sugar Free gum. For Tea I had a Chicken breast fillet and some Broccoli and Carrots, It went down a treat! didn’t totally fill me but that’s to be expected! I’m not going to lie by bed time I was starving and started to think about giving up! and I cheated and had some Frosties! arrgghhh Much to my disappointment! Which means I have had carbs and it will take an extra day for me to go into the Ketosis stage! Tomorrow I need to be stronger! After yesterdays mishap with the cereal! I woke up more determined than ever! I had a Chocolate Orange shake for Breakfast and went shopping, which was extremely difficult! I stocked up on Diet Coke, Sugar free mints and Fish & Chicken Fillets for Tea Times. Its 3pm now and my belly is starting to rumble, I am going to stick it out until later so I can have my meal and then a Cambridge soup for Supper. I am starting to get headaches and I feel a little light-headed, I have taken painkillers and I will have a rest, I am going to do 10 minutes on the Wii Fit later, although too much excersize is not allowed in the first couple of weeks. It’s now 6pm and I ate my meal of the day at 4.15 I had a piece of beef, with a small amount of mushroom, onions and mushy peas, It was all cooked on the George Foreman so no fat/oil was used, it was delicious and I am still quite full now, I followed the meal with a glass of water and a herbal tea, to make me feel fuller and it seems to have worked. I’m doing much better today than I was yesterday so I’m feeling pretty confident! lets hope I last the night! Today I woke up with a Migraine 😦 I took painkillers as soon as I woke up, I had to get up pretty early this morning so I waited about an hour before drinking my first Choc/Orange Shake. By 12pm I was starving and its 2.30 and I’m really struggling, I am managing to keep going but will soon have a soup which should take me over to tea tonight then I will have 1 left for supper! I feel really tired and can’t shake the headache off, I am going to lie down for a while, boredom is starting to kick in because I have no energy to do anything! I’m alone all weekend so I think I will struggle! but hopefully will stay on track by looking at my photos of my sorry self and drinking lots of fluids! I found I struggled until I had my 1 Meal at 4pm, I had a small piece of Beef with mushrooms and some peas. After that I wasnt to bad and managed to be o the rest of the night, I felt much better and later I had my Choc/Orange Shake with Hot Water so it was like a hot Choc, It wasnt too bad but I wouldn’t have it again. My consultant only gave me the one flavour of shakes so it’s getting a bit boring now. I will order some different varieties next week. I woke up early again and had a Coffee, Followed by a Chocolate Milkshake and some Coke Zero to tale with me as I was off shopping for crafty bits and pieces to keep me occupied, I have found if I keep myself busy its much easier as I’m not thinking of food all the time! so I have decided to customise some items for my holiday to Ibiza 🙂 I will be uploading them to my blog as I do them so watch this space! .I thought its best to get my errands done on a morning because that’s when I have the most energy! its 1pm now and I m about to have a soup to get me over till Tea time! I’m having white fish with broccoli and cauliflower. This Morning I had a quick look on the Wii Fit to do a body test, it says my BMI has lowered so I am really pleased with that! I seemed to feel much better today, more energy that I have had in the previous days and I think Iv learnt to not acknowledge food around me! that’s my technique, If I see it or smell it or hear people talking about it I just kinda ignore it! and pretend it didn’t happen or ‘its not for me’ ‘I dont eat food’ a bit of brain training and hopefully this will work! I had the Chilli oriental soup today and it was tasty, I added some pepper to make it extra spicy and afterwards I actually felt like Id eaten something that’s not so bland! I also called my consultant and she’s arrange to come and see me at 1pm tomorrow, a day earlier than the usual weigh ins but I am looking forward to choose more food that I will enjoy and not the disgusting porridges and revolting Tomato soups! also it will be nice to taste something other than Choc Orange Shakes! I am quite fussy so I decided to stick to what I know I will enjoy, or be able to keep down! I am looking forward to try the Choc Mint Crispy Bars! 6 Chocolate Mint Bars & 1 Chocolate Chewy Bar. Well today is weigh in day! I’m a little nervous, I hope the hard work has paid off! if not I will be very disappointed and I m worried if its only a couple of pounds in my first week it may demotivate me :S So fingers crossed! WEIGH IN! I just had my first weigh in and I lost 7lbs! which is half a stone! I’m really pleased just hope I can stick it out and see more results! Not sure if this weeks going to be easier or harder as its been so long since I ate food that I enjoy! I did get to taste one a Mint Choc Bar with a cup of coffee earlier, it was nice to taste some chocolate! a bit worried how the bars and with it being week 2 will affect my weight loss this week, but hopefully I will have a little more energy and fit in some excercise aswell 🙂 ‘Im just 11 lbs off my goal weight for Ibiza, MUST RESIST TEMPTATION. So after the first week I decided there’s no point in updating daily! So here is a quick update to let you know how I’m getting on.. I have struggled all week, although the hunger is not as bad and the habits of the diet have kicked in, I was starting to get very tired of the same bland food day in and day out! I have been really depressed especially on a night time, feeling sorry for myself as lets be honest, If it doesn’t involve food or drink then its probably not that fun! I have also been stressed out at home which makes it a LOT harder! When it came to Thursday (Day 9) I was fed up and desperate not to spend another night in the same mood! so I went out for dinner and had a small jacket potato and 5 Bean quorn Chilli, which was delicious by the way! I know I am not supposed to eat any carbs but after eating this even though at first I suffered a bit of tummy upset, I felt mentally happier strangely! I was full pretty quick and bloated straight away, which made me realise the effect of the carbs. Since then I have stuck to a very low carb diet and havent been that hungry at all! I still have a lot of products left from the Cambridge diet so I am going to carry on using them for a few days but I have decided to stick to a low carb diet and carry on like this as I feel it suits my lifestyle better! I have lost 9lbs altogether now and I am starting to feel better and have had a few compliments which I didn’t expect at such an early stage! As a summary of the Cambridge diet I think its a great diet if you have the willpower and determination and perseverance it requires! I have had a good start and I’m happy with my 9lbs off in 11 days! My friend also done the diet the same as me and has lost 10lbs but has decided to stick to a healthy low carb diet the same as its easier to live a normal life. I felt quite isolated as I avoided food and drink because it made it so much tougher being around something you cant have. As I am still using my products and adding some carbs to my evening meal I have been taking my Cambridge Meal replacement bars to a coffee shop on a morning with a friend and having black coffee with skimmed milk to introduce the real world into my life again instead of shutting the world of food and drink away! If you are about to embark on the diet then I wish you the best of luck! dont just jump in at the deep end, research the diet and decide on the best approach for you and your lifestyle! I will update as I carry on my low carb diet! Cambridge diet look good lose weight low calories milkshake diet review soups surviving Cambridge Diet tips. Previous Post Want to lose weight? Want to eat unlimited amounts of pasta, potatoes,meat etc? Try Slimming World for free with my plan. i started the Cambridge yester and so far so good, nice to read ur blod whilst sipping my shake!! I have just started the diet today was doing exactly the same thing, this review is amazing and has really inspired me, i have just noticed the post is really old.! do you have any advice you can give me? Tomorrow after the weigh in i will go on a a protein meal with veg and then onto low carb, as i feel that my stomach is now just accepting food when i am hungry. Love it – your blog is exactly what I wanted to read. I am on week 2 and everything you have said above is exactly the same as I have experienced. I started on Step 2, same as you. Getting bored with the chicken and vegetables. Fruits of the Forest shake, urrghhh is there bleach in it? Struggle with not being able to socialise and family turn up with MacDonalds… arrrrrghhhhh Have to pass a greasy spoon every morning on the way to work, the bacon …. yum… Resisted so far as I do a detour now !!!! I lots 2lbs in my first week but noticed this morning my trousers swinging round lol – good sign hopefully – weigh in on Saturday noon. As to the next step, have you managed to sustain your weight with a low carb diet?? My weigh ib tmoz guys! Hi! thank you for your reply….oh well after all the cheating and even 2 mcdonalds meals I still managed to loose 9 pounds!! Just starting 2nd week today but I’m still gonna try to o better to see if I loose more cz I know second week you always loose less weight….. but I’m happy!! Hi all – great blog – loving sll the advice & stories:). finished day 5 today without cheating although very tempted!! The bad breath is really getting to me now – any tips? Hey, interesting to see how others are taking to the diet! I have lost over 5 stone this year on it, 3 months from Jan-March doing just the shakes on SS and lost 4 stone. I was a bit flakey during the summer and now back on SS for the final 3 stone. I agree, this diet is only for you if you have serious will power! It is the only diet that has ever worked for me. It will only work if you actually like the products and I love them! As a treat, freeze one of the shakes and make an ice cream and the lemon bars are amazing too! Hi i too have just started well day 11 however i messed up other day had a large bag of haribo type sweets! Preparing for my toddlers party an just kept eating them such a shame for anyone considering cheating dont do it,after the enjoyment im filled with regret its so not worth sabotaging your hard work! I have slipped up a several times, I try even harder the next day. This is day 18 for me, and I have only weighed once (lost 2 pounds) after the first week. I am weighing myself after one month and will report back. I must add that I have been doing a very light meal in the evening three times a week. My goal is to lose 15 pounds. When I did Cambridge before, I stuck to SS and the weight flew off! I was more overweight at that time than ever in my life. My self-esteem was at an all-time low. Talk about a change! My life began to open up, and good things happened (health, etc.). Good luck to all! I started the CD 4 weeks ago and lost 5lb in my first week. Then had to come off the diet after only9 days as I went into hospital. I managed to loose an extra 1lb a week while off the diet, which was great as I was worried I would put on what I had already lost that first week. I am back on the CD and on my 4th day, I am having 2 shakes and one bar with a very small meal. I also have an underactive thyroid which makes losing weight that much harder. My next weigh in is on Wednesday fingers crossed . I have 1 1/2 stone to loose in 8 weeks !! I started step 2 on 18th February and have lost 10lbs. Find it up and down and wondered how you managed eating out? Hi ladies, I started step 2 on Thursday. I’m glad I’ve found this blog, it is definitely going to help with this diet. Its so encouraging to know that it is working for other people. I’ve tried other diets before without great success. This diet is going to work, I’ve got 6 stone to lose and I’m determined this time. My first day I did really well all day but then had to set up a work social in the evening and slipped and had 3 slices of pizza!!!! So Friday I followed the routine to a tee and didn’t feel too bad. Saturday I took my nephew out shopping and really surprised myself as i was able to go into Gregg’s and get him a sausage roll (my fav!) and leave! Today is day 4 and I’m hungry and I’ve had my porridge and soup already….looking forward to my chicken dinner later. Hi I wanted to added my experience. I originally did a shake diet from a shop for 4 months and lost 10lb. Then I heard of The Cambridge weight plan. I think that its Britains best keep secret. I did step 2 for 3 months and lost 3 stone. I got to eat dry chicken ticka and indian salad in Indian restaurants. Chicken and house salad at Nando. I even went to a hog roast. I started to eat after everyone else which is a bit of a first for me and talked more. I was becoming the life and soul of the party. I learnt that food is fuel just fuel. Its not the be all and end all of everything. There is so much more to life than food, sure its nice, but really there’s so much more to experience. I’ve kept it off for 6 months now which is also a first as Im a seasoned yoyo dieter and queen binger. I’d recommend asking a local consultant as they are very friendly and they have to have diet life experience. And mine offered me free monthly weigh in’s to help maintain my weight. Oh also I found out that I was lactose intolerant on the cambridge diet which my doctor told me was IBS for years. They have lactose free milkshakes and soups. I loved the shakes with my milk allowance and icecubes in a blender. The hardest part for me was going into the supermarket. I’m a marketeers dream. I wrote my shopping list whilest drinking my shake. And shoped when not tired or hungry and always with a bottle of water with me. I think if I was going to give any advise would be to stop stresing and start living. I have been on the diet for nearly three weeks..I have lost eleven pounds desperate to get thebothervthree pounds off by Wednesday but I have found it really hard this week.I had a scone and butter and crisps..omg the guilt…so I hope I have managed to correct it over the last three days..
when you feel like you cant cope have a piece of chicken or fish or have a small handful of nuts..that should reduce the hunger pangs! Hi Everyone, I started this diet for the first time back in 2012 and I started at 15 stones and lost 4.5 stones in around 3 1/2 months on soul source, I did have a few cheat days but without a cheat day to look forward to I would have given up! once i lost all the weight I started eating again and skipped the maintance steps and put around 2.5 stones back on,,Then last year in August i started the diet again as i was getting married in October 2013 and went back to 11 stones..now i have been married over a year and have gained all my weight because all I did was eat myself happy..I seem to wake up and think about what I am going to eat and what Im gna eat for lunch and then dinner..I have now started day one of soul source again! Its really hard because its sending mix signals to the body but hey ho need to loose the weight and maintain it this time!! im having the readymade chocolate velvet shakes 3x daily as its easy for carrying around to work etc..and drinking lots of green tea with lemon and water..
if anyone wants any tips let me know..Just thought Id share my experiance as it works but needs determination..
Hi Guys My wife and I are on the CD and are really struggling with recipes and food, could you please share any good recipes with us as we are on the step two. Also is it 80g of each veg 80g in total, as when I weighted the broccoli and colli there was 1 piece of colli and 1 piece of broccoli, this just didn’t seem filling at all. We don’t drink milk so can we substitute more veg instead of the milk? I’m doing the Cambridge diet for the second time. First time went really well, lost 2.5 stone in just under 3 months. This time round I’m finding it much tougher to get through the first few days getting into ketosis. I’ve still managed to drop 4lbs each week in the first 2 weeks and it is going better this week. My boyfriend was away the first two weeks and I think a combination of boredom and missing him didn’t help. I find that cups of tea with milk and sweetener really help cause they make me feel full, but I have to be careful of the amount of milk I have. Anyone got any hints on snacks that don’t take you out of ketosis and you can have reasonable amounts of? Hi guys, I’m starting the CD tomorrow, have a meeting with my consultant in the am. I can’t wait to get started. I have about 8 stone to loose to get to a healthy weight. I have tried all sorts of diets throughout the years but none have worked for me as the weight loss is quite slow, especially as I am older ( late 40’s). I also take medication that stimulates the appetite, particularly for sweet food. So here goes………..
Hi guys, I started the CD sole source on 26 January, on my first week I lost 9lbs, second week I lost 5lbs and I had my third weigh in yesterday and lost 3lbs….it’s slowing down but I’m really happy with the weight loss. To be honest this is probably the forth time I’ve tried this diet and the longest I was able to do it without cheating was before was10 day. Im proud I’ve been able to stick it out but I’m getting married in May…that’s my biggest motivation! I did struggle the first few days with headaches and constantly being tempted to give up but after day 4 I felt great!! Im currently 10 stone 4lbs and I’m hoping to go down to at least 9 and a half stones by May…I’m quite short so a heathy weight for me is 9-10 stones. I’ve got my hen weekend in a few weeks and realistically I know I won’t be able to stay on CD for that weekend but I’m praying I have the will power to get back on it when I return. Good luck to you all and I’ll let you know how I get on. Its my second week on the diet and I lost 9 and a half pounds in my first week! Day one of CD sole source. Already panicking about the thought of no food!…but will push through this to remain positive. I’ve never blogged before so this is my first – just wanted to say how normal I now feel after reading all the comments….. My family rolled their eyes at me today… I know they’re thinking ‘here starts another faddy diet….’ but I am motivated to prove them all wrong. I just want to get down to a size 12/14… I’ve just burst out of my 18’s…. and feeling so huge. The first shake I tried for breakfast tasted like ‘feet’! !… think I put too much water in it as the next shake was actually really nice. I’ll post again next week when hopefully I can report a loss! If you look on SS+ it shows you foods you can have and quantities. I did it that way and just SS and found I lost pretty much the same amount on both. today is my first day on SS and it is horrible.. the soup is powdery and tastes very bad!! i have to lose 10 kilos.. i will keep going.. i wanted to ask if i can eat veggie (cucumber,peppers etc) if i feel hungry? Im starting this diet on rhe 11th of april. The tips on this thread have been very encouraging. I would like to loose 38/40 pounds so about two stones and 10 pounds. Wish me luck i will keep you posted. Hey there. Just came across your blog. I have started Cambridge Last Monday and already lost 4.8kg in my first week. It has been tough , but who wouldn’t say that? I am just glad that I am not the only one who finds it tough at times. Thanks for sharing your journey. Hiya, this is now my 2nd time doing the CD diet and actually don’t mind it only cos I know results areally great! 2weeks on Sunday and I have already lost 13lbs…..I am a big girl so chuffed with this! I am in Dubai doing it thought and I know my UK consultant gave me a list of vegetables to not eat, does anyone have this?